Jimmy and the Pulsating Mass, Kasey Ozymy’s first commercial release, is a welcome addition to the cloud of absurd, emotional games that waft from Earthbound like the scent of a hot pepperoni pizza. This cloud, which includes goofy jokes, deep sadness, and weaponized household objects, includes Undertale, Barkley: Shut Up and Jam Gaiden, and LISA, as well as the forthcoming YIIK and Glitched. 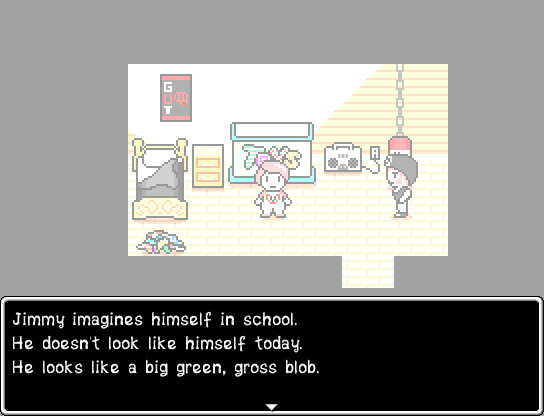 However, Jimmy is its own beast: an occasionally lumpy RPG Maker-fueled journey that showcases humanity and loss in an exploration-heavy adventure about a boy who can turn into a bear. 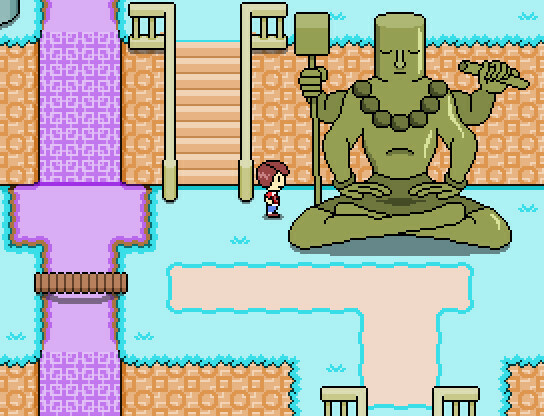 What could this statue mean? It is a mystery! Jimmy is an eight-year-old boy who lives in an idyllic world of talking animals and candy-colored cloud gardens with his parents, older brother, and sad sack uncle. The Pulsating Mass, a grotesque conglomeration of malevolent flesh, threatens Jimmy’s peaceful life. The stakes of Jimmy’s battle aren’t immediately clear: explaining too much would risk spoiling many of the game’s mysteries. It’s one of those games where the role of a reviewer is at odds with that of a more in-depth critic. Suffice to say, anyone breaking the surface of Jimmy’s world should be prepared to shake hands with nightmares. Jimmy is a withdrawn child with a powerful imagination. His insulated reactions subvert the notion of a silent protagonist as a convenient fiction suit. Instead of being the player’s stand-in, he’s just painfully introverted. As a result, it’s difficult to emotionally connect with the first leg of the game. Jimmy is too much of an enigma, and his dreamlike surroundings are too whimsical for consequences to feel like they have weight. However, as Jimmy spends time with his family and imagines what it’s like to walk a mile in the shoes of his defeated enemies, his brief reflections add nuance to the world. Empathizing with his enemies also gives Jimmy cool powers he can use in and outside of combat. As a shy child, Jimmy doesn’t have much control over the outside world. Once he takes the form of the fearsome ’50s-Style Vampire or a cross between a record player and an annoying bird, it’s a different story. By using the Imagination command in battle, Jimmy can switch between his different imagined forms. Each form has different abilities and stat modifiers. As each form levels up, the abilities influence Jimmy’s natural state. Spending time as a bird increases his baseline agility, and eventually provides passive and active abilities that can be used regardless of his form. Watching a sensitive boy construct his own identity by adopting different personae, learning a little bit from each one, is a wonderful, relatable mechanic. At the start of the game, Jimmy’s base form is overshadowed by his other party members, but by the end the mix-and-match advancement can transform him into a versatile powerhouse. By contrast, his family members already know who they are, so their stats and combat roles are relatively fixed. We’ve all been there, Jimmy. Each of Jimmy’s forms comes with a special ability that aids exploration. The ’50s-Style Vampire can scare NPCs and travel through mirrors into the past, while the Low-Level Goon can grab and shake objects. Every NPC in the game has a unique reaction to being shaken, demonstrating Ozymy’s quirky humor and dedication to a good joke. Between the Goon’s early access to the “Steal” command and willingness to shake innocent NPCs for clues, exploration-minded players will make plenty of use of this form. Although the main story is linear, and there only seems to be one ending, Jimmy’s world includes a lot to see and do, including post-game challenges. Finding every piece of gear, secret light bulb, and piece of furniture for Jimmy’s clubhouse requires frequent backtracking, since new abilities unlock paths to side dungeons and optional, challenging bosses. The optional dungeons also reveal more information about the setting and characters, although a little more would help lock the story in place. NPCs also explore the world, traveling between towns on journeys of their own. Their paths are fixed, but seeing NPCs like super-cool rebel Punch Tanaka on their own quests enhances the forward momentum of the player’s own journey. Although towns are small, their design is delightfully eclectic. For the most part, the backtracking and exploring isn’t a pain: most of the puzzles are fair, although it isn’t always clear which environmental features will respond to interaction. Some trial-and-error is necessary, which can get annoying in areas populated with enemies. Jimmy can use the starred skills in any form; the bulleted skills are only in his natural state. 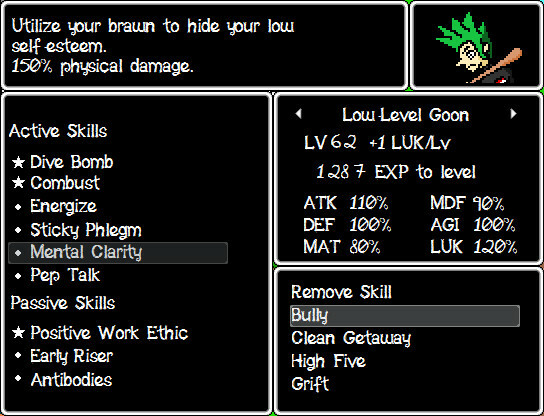 Combat is grounded in standard turn-based RPG Maker fare, but humorous and varied monster designs keep things spicy. The humble “Steal” command is a good example of Jimmy’s approach to monsters. Like many RPGs, enemies carry unique items that can be stolen. However, many enemies also have other stealables. For example, snatching knowledge from an ultra-brainy bookworm reveals useless but fun facts about the world; stealing an edge from a villainous pentagon turns it into a weaker, but still angry square. The monsters themselves are a carnivalesque blend of hybrid animals, weirdo people, and straight-up bad dreams. The only palette-swap designs occur in side dungeons, making each new configuration of enemies into a situation to think through. 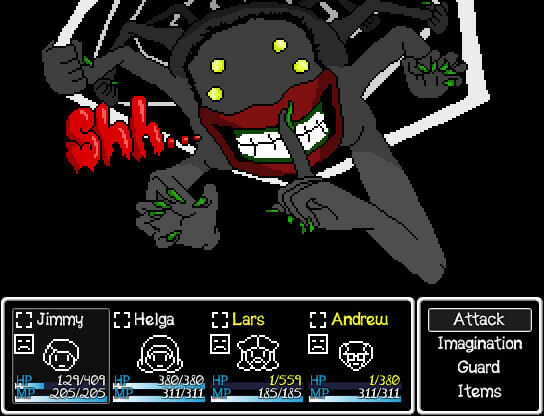 As unique as individual battles are, some difficult bosses may not be possible to defeat without heavy grinding for experience and cash. Thankfully, weaker enemy encounters can be skipped. In addition to their sheer numerical challenge, most bosses have a solid, memorable gimmick. One optional battle takes place on top of a giant, diseased bird. The bird’s parasites must be defeated quickly or else they’ll kill their host, plummeting the party to their deaths; however, defeating the parasites just means the bird will set the party down safely before continuing to lash out in pain. In battles like this, managing status conditions is a path to success. Many attacks cause the “Startle” condition, which outright cancels the turn of a slower character. However, a Startled character also gains a few turns of Alert, which protects against being immediately Startled again. This individual seems trustworthy. The battle screen is probably a mistake. As charming as Jimmy is, it’s not without its lumps. While the setting is varied and exciting to explore, the graphics aren’t especially attractive. Many buildings and human characters have perspective issues, and faces often look a little off. Monsters, animals, and grotesque beasties are much more satisfying: they don’t ping the uncanny valley in nearly the same way. Furthermore, the game included several typos and bugs at release. Ozymy was quick to address them, however there may be more left for future gamers to uncover. Ultimately, Jimmy and the Pulsating Mass is a touching personal story wrapped in good jokes and functional graphics. It won’t win over anyone who’s opposed to grinding or dislikes traditional turn-based battles, but pixel RPG purists should find something to enjoy. Customizing Jimmy personalizes battles while supporting the game’s thematic concerns, while using new powers to explore keeps the old brainmeat flexing. The music’s pretty good too.